My daughter is much more courageous than I am. Sunday afternoon, Staci & I put Allie on a van and sent her off to her first ever week of church camp. She headed out in a vehicle full of boys with people she barely new to a place she’s never been. And she was chomping at the bit to go. There’s no way I could have done that at her age. (Honestly, I’d have a hard time doing it now.) I’ve always had a cautious personality. My brother Aron was always the risk-taker in my family. He was the one jumping off the high dive or skating off the roof. He has the scars to prove it. But one thing he’s never been accused of being is boring. Aron brings the fun with him. And Allie’s the same way. She sees the potential for good in a situation and chooses to be brave. She dives head first into discomfort and sees what happens. She jumps into the van of boys because she anticipates the fun that camp could bring. But me? My tendency has always been to avoid rather than dive in. I always wonder how much good I’ve missed because I chose to back away from the struggle instead of engaging. Yesterday, Chris talked about the theme of harder roads and how he typically avoids them. I commiserate with that on so many levels. It’s so much easier to avoid conflict or struggle. I value peace over conflict, leisure over struggle. I’m not alone in this, right? In our effort for peaceful lives, we often see difficulty as something to avoid. And maybe that’s my problem. Because life — real, exciting, quality, make-a-difference-in-this-world life — begins at the end of my comfort zone. The hard is what makes it great. So today may we all choose the harder roads. May I be more like my daughter and brother and choose to dive in rather than shrink back. May you run into conflict instead of avoiding it. You may get some scars, but you’ll have a much better story. 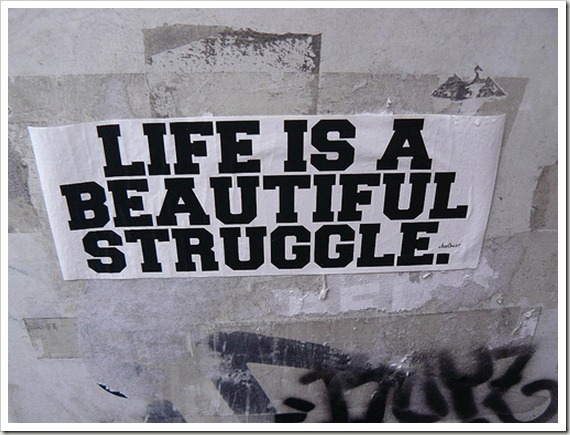 May we all embrace the beautiful struggle that life is. This entry was posted in Ordinary Days and tagged comfort zone, persistence, struggle. Bookmark the permalink.